This is the first article in the promised new series looking at radical ‘impressionist’ type painting outside the group of French Impressionists, and typically in countries other than France, in the period 1870 to 1914. My concern is that, if you look at even the most extensive accounts of the history of painting, apart from French Impressionists, there is hardly any reported artistic activity from about 1870 to 1895. The version of history with which we are presented places great emphasis on the French Impressionists, to the exclusion of all others. It is simply not credible that the many active painters throughout the rest of Europe and North America were just pumping out trite Salon-style work, while only the Impressionists were leading the way to the future. 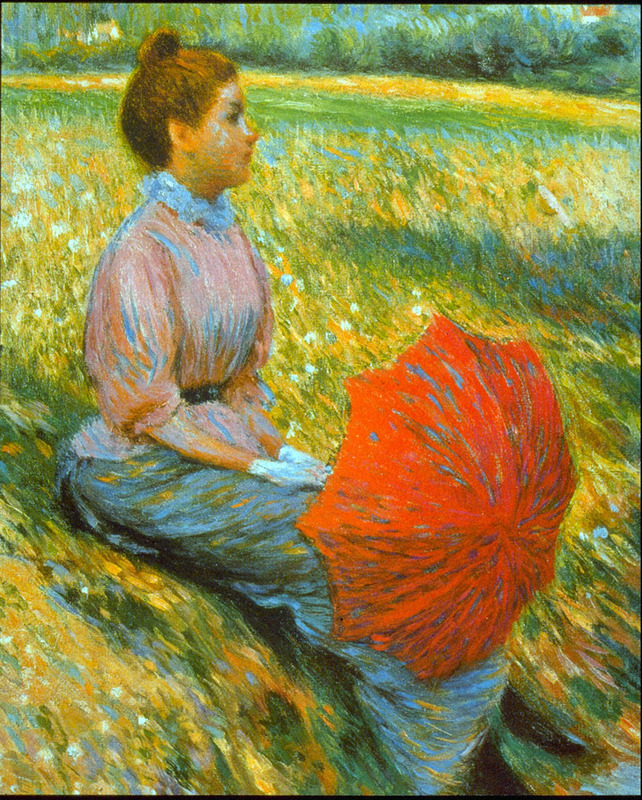 Subsequent promotion of the Impressionist movement has not only eclipsed the work of other painters at the time, but has also portrayed Impressionism as a unique and revolutionary change. However I have already shown how there is good evidence that even in France the changes that Impressionism brought were in fact almost inevitable; Anthea Callen’s recent book gives many pointers to a more balanced account in which Courbet and the Barbizon School were as a much a part of the change that is now wrongly attributed solely to the Impressionist movement. My purpose in this series is therefore to look at some of the other painters outside the French Impressionists, in Europe and North America, and consider where they were heading, whether they were ‘impressionist’, and whether Impressionism was actually part of a much wider change taking place in painting at the time. It is easy to forget that, in the middle of the nineteenth century, Italy had a period as unsettled and revolutionary as that in France. Much of northern Italy was ruled by Austria, and there was no Italian state. Political insurrection started in the north, and a strong nationalist movement sought an independent Italian republic based on Rome – something which Garibaldi and Mazzini championed. A group of mainly Florentine artists and intellectuals started to meet in the Caffè Michelangiolo in Florence, from which the Macchiaioli emerged. Most had already volunteered to serve in the uprising against the Austrians, and for the early years at least their motifs were often military. From the outset the Macchiaioli had political as well as artistic agendas and objectives. De Tivoli and Altamura, early members, went to Paris in 1855 for the Universal Exposition there. When they returned, de Tivoli proposed that they paint using macchia (in French taches, English patches), and used a Claude glass (dark mirror) to view the motif, so that they could define its contours and values. Emphasis was also put on creating small sketched paintings en plein air, followed by larger, finished works in the studio. The group was named the Macchiaioli by a particularly scathing critic in 1862, at which time their works were being held up to ridicule. Continuing their political and military engagement as well, in 1866 Sernesi died from wounds sustained while fighting for Garibaldi’s forces near Venice. Their work gradually became better accepted, and painters from the group travelled, particularly to France in 1872 and thereafter. Boldini moved to Paris in that year, where he was friends with Degas and John Singer Sargent, whose portrait he painted twice. The following year Zandomeneghi moved to Paris, where he was in the outer circle of Impressionists, and good friends with Pissarro, Sisley and Degas. In 1878, Martelli worked in Paris, where he was friends with Manet, Degas, and Pissarro. Although some of its members lived on well into the twentieth century, the group gradually faded away after 1879. There are several uncanny parallels with the Impressionists, including the importance of the tache and plein air painting, early critical hostility followed later by acceptance, and of course the tragic deaths of Sernesi and Bazille in war. However there are also some marked differences, including the lack of use of high chroma, lasting political and military involvement, and acceptance of more ‘finished’ studio works, which were often successful at exhibitions, even the Salon in Paris. The main members included the following. Giuseppe Abbati (1836-1868) Following study at the Venice Academy of Fine Arts, he first met members of the group in 1856, but in 1860 lost an eye fighting for Garibaldi. Following that he joined the group, and in 1861 refused a prize from the National Exhibition in Florence. He fought again in 1862 and 1866, between which his painting flourished. He returned to painting in 1867, but tragically died of rabies contracted from his own dog the following year. Cristiano Banti (1824-1904) He studied at the Sienna Academy of Fine Arts from 1842, went to Florence in 1850, and joined the group in 1855. Painting extensively en plein air, he travelled to Paris in 1861, where he worked with Corot and Troyon, and discovered the work of Decamps. Although he returned to paint in Florence where he was made Professor of Fine Arts in 1884, he made further journeys to Paris and London. He built a large collection of Macchiaioli paintings which was eventually donated to the Palazzo Pitti. Giovanni Boldini (1842-1931) He studied at the Florence Academy of Fine Arts from 1862, joining the Macchiaioli in 1864. Unlike most of the others in the group, he preferred painting portraits. He travelled to Paris for the Universal Exposition of 1867, where he came under the influence of Courbet and Manet, and formed a long-lasting and close friendship with Degas. After a brief spell back in Italy, he moved to London in 1870, where he built himself a reputation as a society portrait painter, which he continued in Paris from 1871 onwards. In 1876 he abandoned his Macchiaioli style for higher chroma, rapid bravura brushstrokes, which remained distinctive in his work thereafter. He made friends with John Singer Sargent, whose portrait he painted twice, travelled with Degas to Madrid, and established a reputation in the USA through the Wildenstein Gallery in 1897. After his death his paintings remained popular, and he became known as the ‘Master of Swish’ from his brushstrokes. Odoardo Borrani, Peasant Child at Castiglioncello (c 1865), oil on panel, 23.3 x 14.7 cm, Private collection. Wikimedia Commons. Odoardo Borrani (1833-1905) Initially apprenticed in Florence, he studied at the Academy of Fine Arts from 1851, and joined the Macchiaioli in 1855. In 1859 he volunteered for military service, following which he undertook extensive plein air work. Despite considerable success in exhibitions during the 1870s and 1880s, he found little work in his later years and eventually died in poverty. Vincenzo Cabianca, Peasant Child at Montemurlo (c 1860), oil on canvas, 20 x 12 cm, Private collection. By archivio Cabianca (opera propria foto archivio Cabianca), via Wikimedia Commons. Vincenzo Cabianca (1827-1902) He studied at the Venice Academy of Fine Arts from 1845, but was soon involved in the unrest, ending up in prison. On release he went to Florence, where he joined the Macchiaioli in 1855. Although he continued to make history paintings in the studio, he also painted extensively plein air in true Macchiaioli style. He went to Paris in 1861, where he admired the work of Decamps. 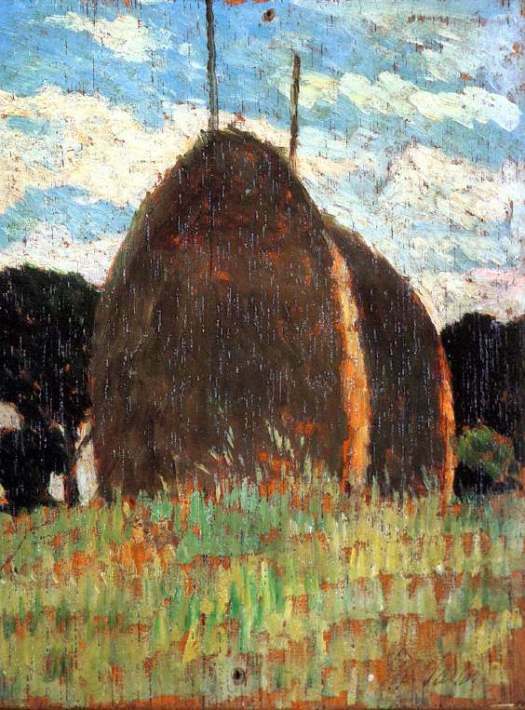 On his return in 1863 he set up his studio in Parma, but kept in touch with the Macchiaioli. Moving to Rome in 1870, his work became celebrated there. 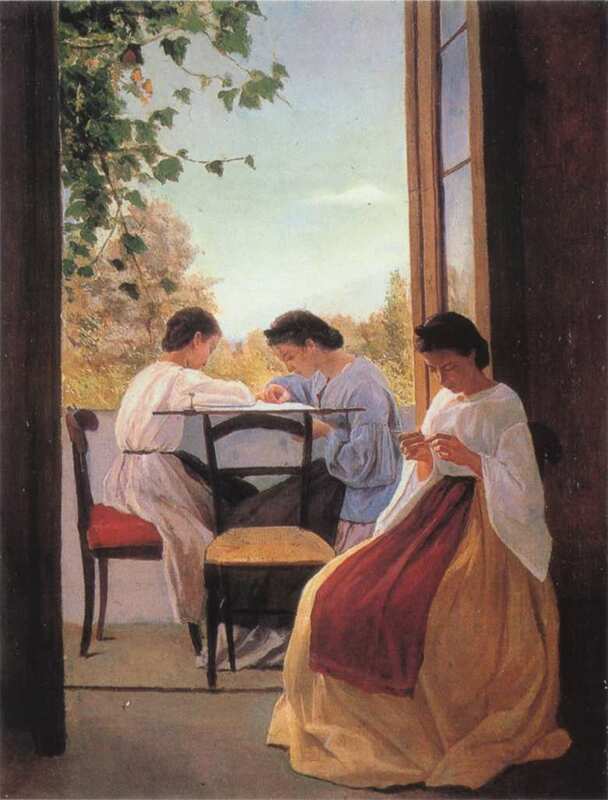 Adriano Cecioni, The Embroiderers (1866), oil on canvas, 52.5 x 41 cm, Private collection. Wikimedia Commons. Adriano Cecioni (1836-1886) He started studies at the Florence Academy of Fine Arts in 1859, but volunteered for military service shortly afterwards. His major studies were in sculpture, but in 1864 he went to Naples and met De Nittis there. He exhibited in the Paris Salon of 1870, where he was able to admire the work of Courbet. However he was not impressed with the ‘modern’ French art of the day. He returned to Paris in 1871, then to London in 1872, where he found a market as caricaturist for Vanity Fair. He returned to Florence the following year, where he established himself as the critic and theoretician of the Macchiaioli. He was made a Professor in 1884. 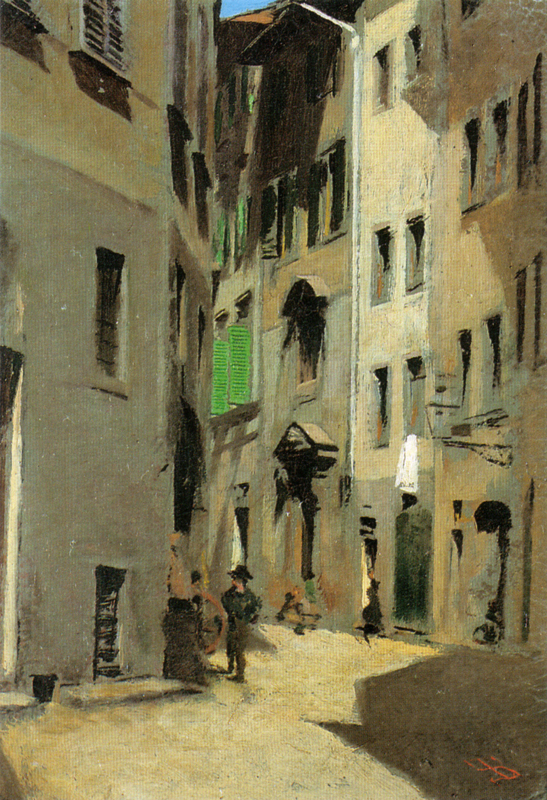 Nino Costa, Strada in pianura (1890), oil, further details unknown. Fondazione Cariplo, via Wikimedia Commons. Nino (Giovanni) Costa (1826-1903) He studied at the Rome Academy of Fine Arts from 1845, where he was involved in the defence of the city in 1849. He then worked to the south-east of Rome for ten years, during which he made friends with Lord Leighton and George Mason, from the UK. After further military service, in 1859 he moved to Florence, where he joined the Macchiaioli. He travelled to Paris and London in 1861, and later lived in the artists’ colony at Marlotte, in the Forest of Fontainebleau. He returned to Florence in 1863, but was soon involved in military action again. He was appointed to the staff of the Florence Academy of Fine Arts in 1870. Later in life he wrote his memoirs. Vito d’Ancona (1825-1884) He started studies at the Florence Academy of Fine Arts in 1844, and was soon involved in the group which became the Macchiaioli. He too became involved in politics and military action, but from 1856 travelled in pursuit of academic studies, meeting Lord Leighton. He refused an award from the 1861 National Exhibition in Florence. In the 1860s he moved to Paris, where he worked for seven years before returning to Florence. Serafino de Tivoli (1826-1892) He studied painting under Carlo Markó, a Hungarian landscape artist in Florence, but volunteered for military service in 1848. 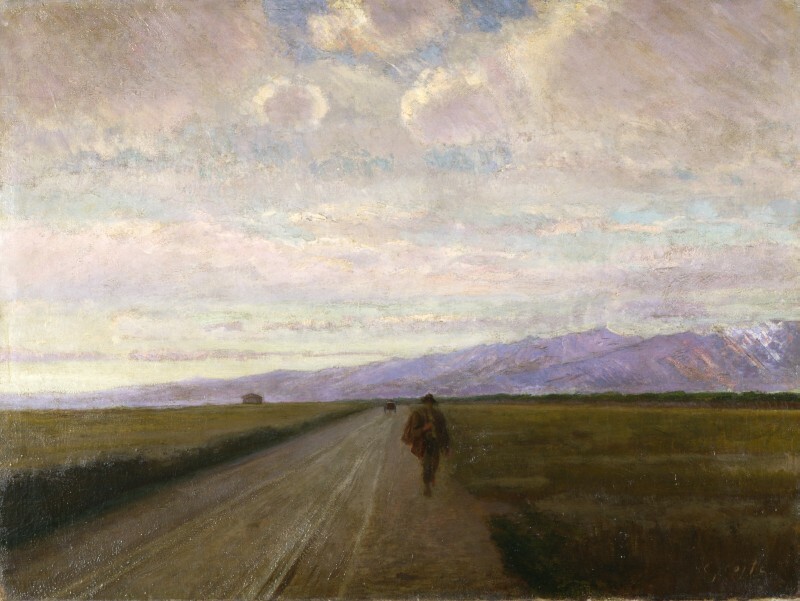 Following that he was one of the earliest and most active members of the Macchiaioli. In 1855 he went to Paris for the Universal Exposition, where he spent time in the studios of Decamps, Troyon, and Rosa Bonheur. He was an early enthusiast for the newly developed Macchiaioli style. He returned to work in Paris from 1873 to 1890, returning to Florence for his final couple of years. Giovanni Fattori (1825-1908) He went to Florence in 1846, where he started studies in the Academy of Fine Arts. Between 1848 and 1850 he was militarily active, then returned to complete his studies and to play an early and active role in the Macchiaioli. He was appointed Professor in Florence in 1869, and went to Paris in 1875, where he found greatest appeal in the paintings of Manet and Corot. He then returned to paint and teach in Florence. 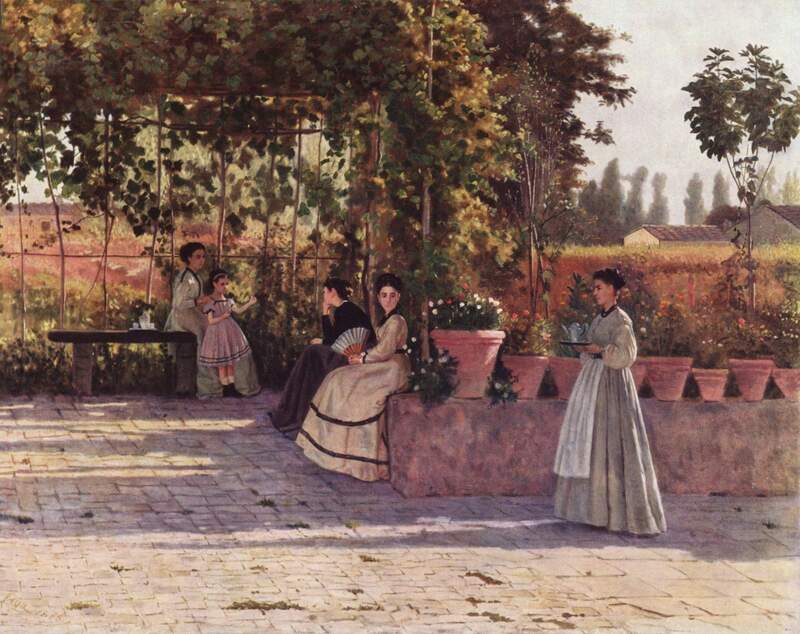 Silvestro Lega, The Pergola (1868), oil on canvas, 75 x 94 cm, Pinacoteca di Brera, Milan. Wikimedia Commons. Silvestro Lega (1826-1895) He entered the Florence Academy of Fine Arts in 1843, and volunteered for military service in 1848. He started to meet with the Macchiaioli in 1852, and in 1860 painted a series of military works featuring chiaroscuro effects. During the 1860s he took to painting plein air. He ceased painting relatively early, and suffered financial problems with a gallery which he had set up. Diego Martelli (1839-1896) He started meeting with the Macchiaioli in 1856, then volunteered for military service in 1859. Inheriting a large estate at Castiglioncelli on his father’s death in 1861, he spent long periods painting there. After visits to London and Paris in 1862, he welcomed painters to his estate, where many of the great works of the Macchiaioli were completed. From 1867 he also engaged in journalism, both in art and politics, but by 1878 was in financial trouble and forced to flee his debts. He then lived in Paris, where he made strong friendships with Degas and Pissarro. He returned to Italy, where he tried to maintain formal dialogue with the Impressionists, but this fell into disarray. Antonio Puccinelli (1822-1897) Born into a poor family, he frequented the Florence Academy of Fine Arts, and was an early member of the Macchiaioli. After military service, he won a scholarship which took him to study in the Rome Academy of Fine Arts. He later worked at the Florence Academy, and following several awards for his paintings, was appointed Professor there. Raffaello Sernesi (1838-1866) He entered the Florence Academy of Fine Arts in 1856, and joined the Macchiaioli from there. He saw military service in 1859, following which he returned to paint in Florence. Whilst pursuing his interest in Masaccio, Lippi and Botticelli, he painted extensively en plein air. In 1866 he again saw military service, but died of wounds sustained during Garibaldi’s action at Venice. Telemaco Signorini, Via Torta in Florence (c 1870), oil on canvas, 16.6 x 11.3 cm, Location unknown. Wikimedia Commons. Telemaco Signorini (1835-1901) His father was Court Painter to the Grand Duke of Tuscany, and gave him his first painting lessons, while he studied drawing from life at the Florence Academy of Fine Arts. In 1855 he started meeting with the Macchiaioli, and travelled to Venice, where he met Lord Leighton. Following military service in 1859, he returned to painting, and later went to Paris. There he was impressed by the work of Corot, Decamps, Troyon and Daubigny. 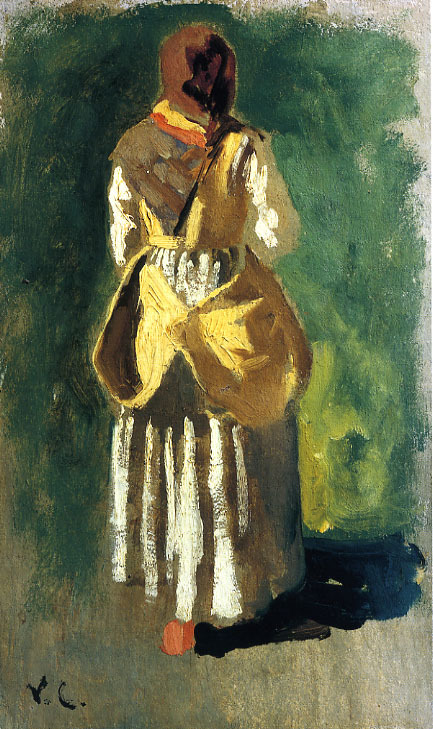 On his return to Florence he engaged in plein air painting, and later worked with Cecioni on theoretical aspects of the group. He travelled further in Italy and Europe, including several visits to Paris, where he achieved critical and commercial success. He was appointed Professor at the Florence Academy in 1892. Federico Zandomeneghi (1841-1917) He entered the Venice Academy of Fine Arts in 1856, and in 1860 saw military service. After that he returned to Venice, but was arrested and imprisoned there in 1862. He fled to Florence, where he met with the Macchiaioli. In 1866 he was able to return to Venice, but moved to Paris in 1874 where he met with Impressionists, particularly Pissarro, Sisley, and Degas. He took part in the Impressionist Exhibitions of 1879 and 1880, and the critic Huysmans was a keen supporter of his. Although he maintained contact with the Macchiaioli in Italy, he continued to work in Paris until his death. 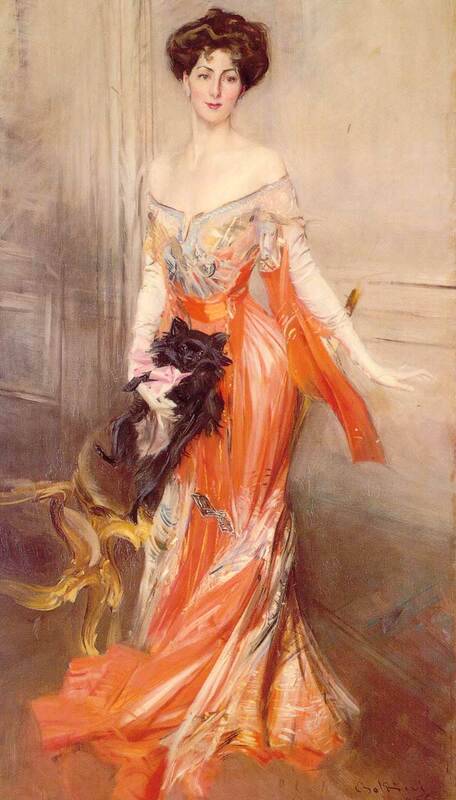 The next articles in this series will consider Giovanni Boldini, Giovanni Fattori, and Federico Zandomeneghi. Posted in Painting and tagged Abbati, Banti, Barbizon, Boldini, Borrani, Cabianca, Cecioni, Costa, Courbet, d'Ancona, de Tivoli, Degas, Fattori, Impressionism, Italy, Lega, Macchiaioli, Manet, Martelli, painting, Pissarro, Puccinelli, Sernesi, Signorini, Sisley, Zandomeneghi. Bookmark the permalink.